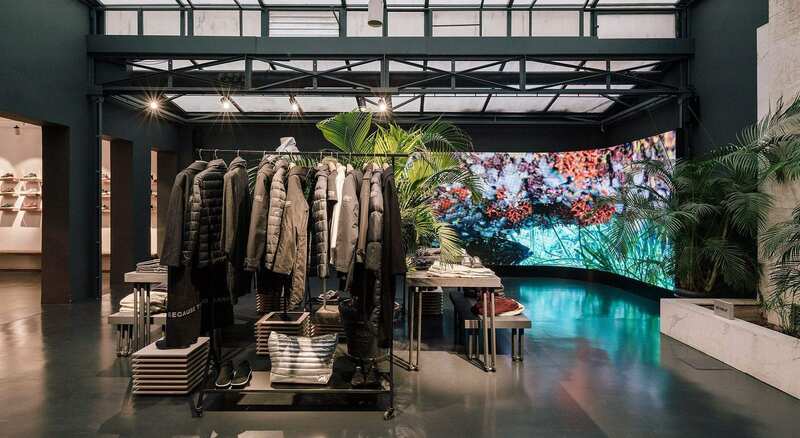 Ecoalf, the sustainable fashion brand that makes clothing garments from the plastic bottles we throw away, has chosen TRISON to provide visual technology to all their points of sale. The challenge brought to us by the brand consisted in integrating this technology in such a subtle way that instead of standing out in the space, it adhered at all times to the philosophy of the brand and its Eco sustainable model. It was clear to us in TRISON that we were dealing with a distinct retail project, as at no point could technology break with the image and concept that is Ecoalf. We therefore decided that the hardware should not be intrusive and so the best solution would be to embed it into the furniture. This would allow the visual content to be the principal nexus unifying technology with the brand philosophy. It was vital for Ecoalf to make known to their clients the work that went into each product so that they may visualise the creation process of the garment and accessories they are purchasing. 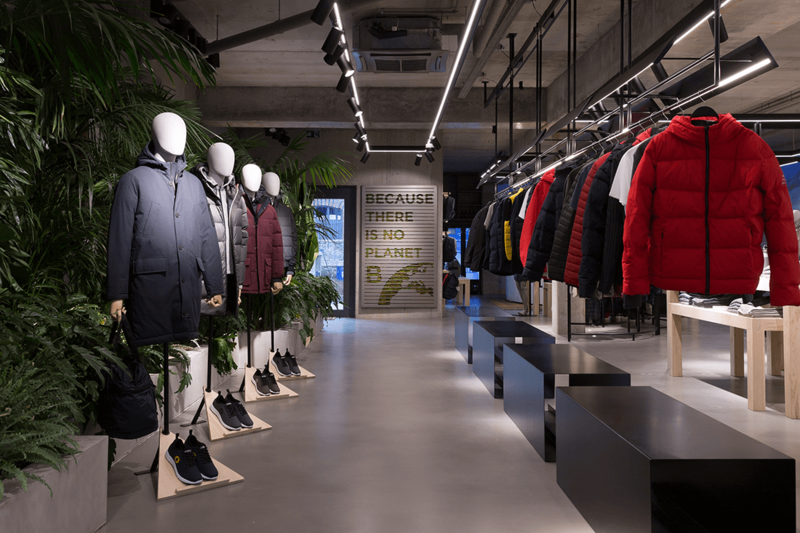 Due to this, and in the context of the international expansion of the brand, a collaboration between TRISON and Ecoalf is formed for what would be the first flagship store abroad, in this case, Berlin. Ecoalf opens its first European flagship in the cosmopolitan Berlin neighbourhood of Mitte, with furniture, design, and architecture taken from recycled material and using fully renewable energy. A sustainable purchase, without a doubt. 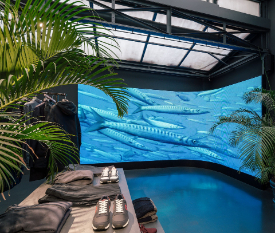 The space, as well as being home to the brand’s new collections, has also been turned into a resting space with books, gardens, and projections of marine life becoming dynamic thanks to the integrated visual technology in the store. TRISON has integrated various turning totems in the window display of this flagship, a LED screen of large proportions and another embedded in the pillar working as a bottle bank. The firm chose Madrid, its hometown, to locate its spanish flagship store. In the central Hortaleza street we can find an open-plan designer space, with sustainable fashion and very technological. At the end of the store there is an enormous skylight and a large curved LED screen with the brightness helping to create a different type of atmosphere. A place where one can imagine the garments floating around the deep blue sea. Fish, seaweed, the sound of the sea and sustainable clothing in a city without sea but with a lot of pollution. 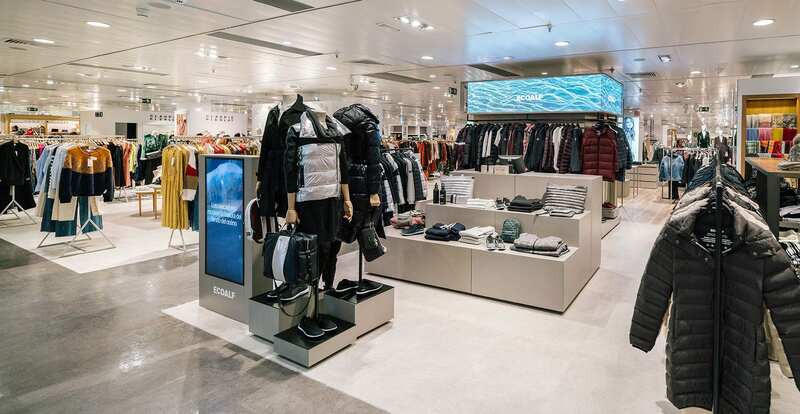 Ecoalf presented TRISON with two objectives for the digitalisation of its shop in department stores: That the brand was clearly visible from any angle and that of differentiation from the other brands on the floor. in order for Ecoalf to differentiate itself from the rest of the brands, we believe that clients needed to enjoy the buying experience in these department stores. Without a doubt, the differentiating factor was just that, that every visit was unique and different. The correct choice and updating of the content to follow significant dates (Valentine’s Day, Black Friday, Christmas…) would contribute to the creation of different ambiances on the same stage, converting the stand into a dynamic space, a unique space. Without a doubt, technology is capable of integrating itself with any type of philosophy without seeming intrusive, whilst offering a vanguard aesthetic and adapting to the architecture and interior of each space.